Go to the Channels feature in your dashboard. When you are there, you'll click to create your first channel. First you will name your channel, then below that you can choose to add a Live Stream to your channel. It will let you choose from already existing live streams in the list. Click on the + sign to add it. On the right side of the page, you can upload an image to go with your player. 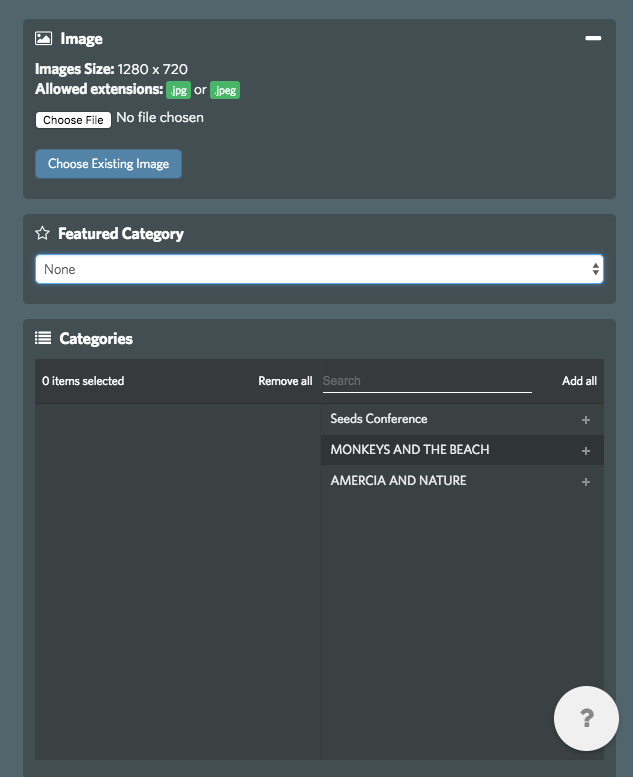 The image you select will be the default that shows up if you add a playlist or live stream that does not have an image attached to it. You can then choose a category to "Feature" and also select which channels you'd like to add. This will allow you to select from an already created category. A category is basically a collection of playlists. If you are not sure how to create a category, click here. After you've made your selections, you should be all set up! Hit the blue check mark to save. You can check to see what it looks like by clicking the Media Center button, and copying and pasting the link into your browser. If you need to make any changes, you can do so in the Options button, or you can also make edits to your playlists in the On Demand section.